For more than 30 years, Leland Ruzicka has been the owner and caretaker of a legendary Black Hills bar and live music venue, The Back Porch in Spearfish. It would be virtually impossible to find a live music fan between 30 and 70 in the Hills who doesn’t have a Back Porch story, and for Ruzicka, the list is endless. Ruzicka’s ownership is the longest of any of its several owners, but the Porch’s history as a live music venue started at least 10 years earlier, and the building has been there since, well, a long time. 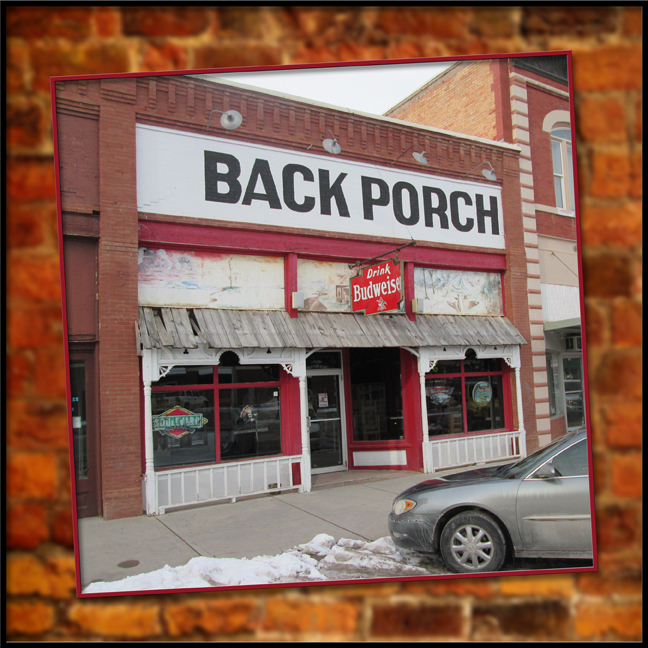 Before being converted to a family-style restaurant in the mid-‘60s, the building that now houses the Back Porch was an International Harvester implement dealership. Danny Island turned it into a bar, featuring a mix of country and rock bands. Regional touring bands, local bands, and even some national bands, among them Flash Cadillac and the Continental Kids and Commander Cody and the Lost Planet Airmen, played the Porch. South Dakota Rock and Roll Music Association Hall of Fame members Red Willow Band and The Kenny Miller Band were regular performers there, as were Ace in the Hole, Rodeo, Group W, Platte Valley Band, Broken Coach, and Back in the Saddle, as well as RPM, whose guitarist, Bruce Neubert. also is in the hall of fame. These were great years for live music, and the Porch was often packed to the rafters. Merry Gilford bought the bar in the early ‘80s, ran it for about three years, and sold it to Bruce Duba, who ran music for a while, but cut back to hosting bands just during the Sturgis Rally. Shortly into Duba’s tenure, Ruzicka bought in to the Back Porch business. It wasn’t long before Duba sold his share to Ruzicka, who brought back live music in the late ‘80s. The Back Porch entered a new heyday, again providing a showcase for talented musicians from around the region. But this time the focus was more on rock and roll acts. The Back Porch was the first to bring Indigenous, a band from the Yankton Sioux Reservation in southeast South Dakota, to the Black Hills. The young family band was a sensation, soon being invited to play at venues throughout the Hills. Indigenous, though not with the original lineup, continues to tour today. Other bands that rocked the Back Porch in the ‘90s included Head East, Iron Butterfly, LA Guns, Molly Hatchet, Pat Travers, Savoy Brown, and VanZant. In more recent years, fewer nights have seen live bands at the Porch. But, it wasn’t too long ago that an up-and-coming band, Trampled by Turtles, provided great nights of entertainment. Not long after, Trampled by Turtles hit the big time. Crowds flocked to the Back Porch to enjoy some of the best live music in the region, but it wasn’t only the love of art that drove Ruzicka to keep hiring bands. “It’s a business,” he said. “Bands would tell me how great they’d done and I’d say, ‘I’ll look at the cash register and find out how well you did."